Ruby Wallis is a practice-based PhD researcher with National College of Art & Design, Dublin (NCAD) & GradCAM. She completed her M.A. 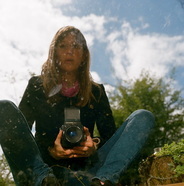 in Documentary Photography at The University of Wales, Newport and received her Degree in Fine Art from Cluain Mhuire. Galway-Mayo Institute of Technology (GMIT). Wallis Lectures Photography History and Theory at Griffith College Dublin. In 2013 Wallis has had work published in Super Massive Black Hole photography magazine (SMBHmag). Recent exhibits include, The Lab, Dublin; G126, Galway; and Basic Space, Dublin. Wallis also presented her research practice at On-Walking - International Multidisciplinary Conference and at Portfolio 13 - International Portfolio Review, Dublin. Recent publications include The Journal of Artistic Research (JAR). Wallis has recently been nominated for the Prix Pictet award by Trish Lambe, The Gallery of Photography and had work selected for Claremorris Open Exhibition (COE) by Andrew Wilson curator of Contemporary Art at Tate Britain. Wallis is working towards Illuminate, an exhibition resulting from a year long residency with Galway County Arts Office and The Brothers of Charity. 'Unfixed Landscape' Is it possible to define "place" through artistic practice?